Low cost, "easy drinking" wine. If you're looking for a good table wine, or you typically enjoy wines less than $10, this one is for you. It's enjoyable and fun without any of the pretentiousness of other more expensive selections. This wine is NOT an example of what Malbec can do. There's none of the fruity, gritty, schweaty qualities that I've come to love in this grape. If you've had a GOOD Malbec, be warned, you will be disappointed. I'm always looking for an easy-drinking, under $10 bottle. Thanks for the tip. No problem! How do you like the new wine review format? I think I am going to try this instead of waiting to post what I drink... It's quick and easy and saves me from having to write down my notes and then transcribe them here! I smell snob, hee hee. Okay, thanks for allowing us under $10 followers NOT to be demeaned. I think it's amazing how a grape can taste so different depending on who's producing it and where it's from. Price isn't the only factor. LOL! I was really trying not to be a snob on this one but also wanted to make sure people would know what to expect! You're absolutely right, price is not the factor but this one just seemed atypical of what I would come to look for in a good Malbec. Nonetheless, I still totally cremated this bottle last night! Not a drop left! You bring up a good point though, it's always cool to see how much a type of grape can vary by producer! What do you look for in a Malbec? 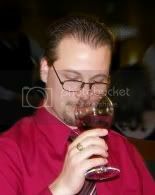 Drank alot of Malbec since Thanksgiving, thanks to my younger brother. I am actually drinking one of mine tonight. (the most expensive of the lot)and the one I put on the bottom of my list. are often found under $10. On a similar note (Malbec) I recently attended a tasting that included the 2005 Cheval Des Andres a collaboration between the head wine maker at Chateau Cheval Blanc and Terrazas De Los Andres in Mendoza. predominently Malbec, blended with Cab Sav, Merlot, and Petit Verdot. It was on the other side of the spectrum from the wine featured here. The Cab and other less predominent grapes did a great job of mellowing the rich dark Malbec, adding structure and balance. Still fell short of the price tag in my opinion, time in the bottle could change that. Cool to get to taste it though. That's really cool Matt! The winemakers from Chateau Cheval Blanc is very well respected and I bet this blend was NOT disappointing! How bad was the price tag on this one? This is probably the shortest comment in history, but I love the new format, seriously. Thanks man! :) I always appreciate the comment love! 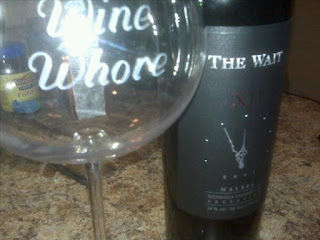 I think I'm going to try this again with tonight's wine! Price tag was $85.00ish but going price online is $60.00. At $60.00 I might pick one up to see how it's doing several years down the road, but I couldnt pull the trigger at what they were asking. I guess I was expecting more complexity but think maybe it was just to closed up. That does seem a bit high, $60 though would be acceptable. Did they give it time to open up or did they just pop the cork and pour? He said he opened it at 8am and this was at 12:30ish so plenty of time. Hmm, you're right, that should have been plenty of time! Why do you think it was closed up? I always hate when I am expecting more character and/or complexity and it falls short! Do you think this is caused by just too high an expectation going into the whole tasting?